three umbrellas: Hero Hostesses Blog Hop! 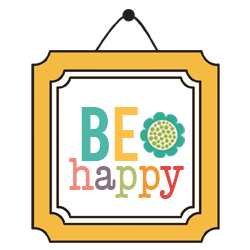 Welcome to Hero Arts 2015 Spring Catalog Blog Hop! here from the blog of the effervescent Judy Jung. Hero Arts will be awarding prizes from randomly drawn comments. of winning! You can find today's master hop list here. Now it's time to meet my card. Earlier on Instagram, I shared a shot of my ink smooshed background, ala Laurafadora. It was all dressed up with nowhere to go. When I saw Absolutely Awesome, I knew that it belonged on my card. Kelly Rasmussen. I'm hoping to see more original sentiments from Kelly in the future. onto the card. I love how the colors pooled in certain areas of the design. The sentiment was gold embossed on vellum and I used spray adhesive to attach it to the card. Some gold sequins finished off the card. Next up is my hostess sista, Lin. I can't wait to see what she's created! Remember that all products shown on the hop are now on sale in the Hero Arts Online Store. Happy hopping, and happy shopping! Love your bright fun smooshed card Donna, the colours are fabulous!! Have enjoyed hopping again with you this year. Love the colors in the card! So pretty! Beautiful card - LOVE that sentiment!!! Donna, this card is outstanding! I love that pretty and colorful background with that beautifully embossed vellum sentiment panel! Beautiful card Donna! I must try the smooshing technique!! Thank you for sharing! WOW! That background is amazing! Gorgeous card! Donna, I love your colorful card! Beautiful! Love the background Donna!! I agree with you this sentiment is one that is "needed"! So glad you are on the Hero Arts team!! Wow! What an amazing effect! Love this card. I have to give this a try. Donna, wow, this is so creative and I love the rainbow of colors. WOW! LOVE, love, love those colors!! Wow, just what we needed on a cold winter's morning! The colors are so bright and warm...thanks for sharing. Beautiful work! So excited for the Hero Arts new Catalog! I love how the gold embossing on the vellum looks with the rainbow colors. Very pretty. Stunning BG!! Sure would brighten up anyone's day!! I love using distress inks like you did on the background! Great card! I could pick one of your cards out of a lineup every time :)) Love this beauty, Donna, and so pleased to be hopping with you once again! Love your stunning card, so beautifully crafted with the pretty colors!!!! What a neat geometric background! So gorgeous!! I think you are my background-creating idol, Donna!! Always amazing! Fabulous background for this awesome sentiment. Such a pretty card. Love the geometric designs and the colors. Your rainbow of color card cheered me so this morning! Love, love, love everything about this card! Lovely colors! So vivid, and the embossing fits perfectly! fabulous bright colors. Love your "smooshing!" WOWZA!!! What an absolutely GORGEOUS Card!!!! Love!!! I can see I'm in for some new backgrounds. Love them. You smoosh so beautifully! You are right; that sentiment is perfect to finish off that fabulous background. I am so happy to be hopping with you and the hosti sisters (but we were the first!!) I love being your effervescent friend!! Big hugs. Your card is truly amazing looking! Wow your background is beautiful... Such great colors!! Oh, I love this card. I always look for cards that fit that 20- 35 age group, and this would be perfect. Thanks for sharing. That is stunning! I love that colorful background! 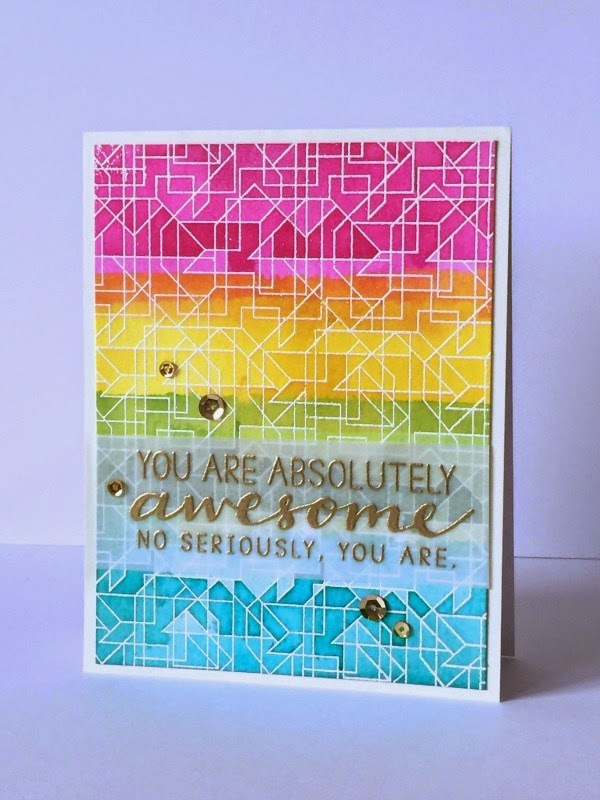 You are so right...Absolutely Awesome is the perfect addition to your card, Donna! Love your smooshed background, too! Oooooh your card is so gorgeous Donna! Sequins!! great idea as I have a large bag of them and was a little unsure what to do with them... love the card and the colors too! anything bright works for me!! thanks for sharing! Wow! love how colorful the background is and the sentiment on the vellum is beautiful. What a cute and colorful card! I love your Lines Background project! Laura Bassen style smooched is what that stamp screams for, and you did it beautifully. So stinkin' beautiful, Donna! LOVE!!! Wow-what a bright eye catching card! I never heard of smooshing before. I'll have to try it! Gorgeous card, Donna! I love how you use color, just amazing! I LOVE this card! Absolutely love it! Love love love the water color background! Simply gorgeous! OH WOW! Your card knocks my socks off! I love the rainbow background and the sentiment is cute! Great card! The coloring is especially fun. Love, love, love your background! Donna, this card is so gorgeous! Love the beautiful, soft colors you used, and the gold embossed sentiment looks amazing! So happy to hop with you this week! I love your card colors Donna. they are always so beautiful! In love with the background. The lovely colors. Your smooshing is delightful, and I love that the simple sentiment over vellum doesn't detract from the cool background! I absolutely love this card! Love the bright colors and the splash of bling! Donna I could just smoosh you!! This is just brilliant... is that really Kelly's handwriting? WOW! What awesome cards, no seriously, yes they are! 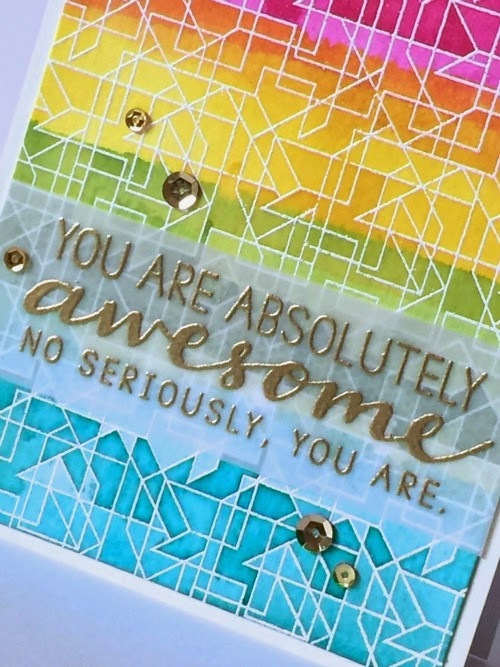 LOVE LOVE LOVE the vibrant colors and how you used that sentiment! Donna----> absolutely awesome...., no, seriously, you are. Wow- this is just amazing! LOVE the colors! Thanks for the inspiration!! Hi Donna, that card is dressed to go...gold sequins and that gorgeous sentiment take it to the top! Your background is gorgeous and the gold embossing on vellum is the perfect finishing touch. For a smooshed card, it's fabulous! The colors are so vivid and I love the sentiment on the vellum. Fabulous card, Donna! Awesome colors & the gold embossing is the perfect touch! Those colors are stunning and employing my favorite water coloring. I love the smooshed technique!! That Laurafadora!! Beautiful colors!! Loving vellum these days!! What an awesome background on your card, Donna! Love it! wowzers!! this is beautiful. so vibrant. Thanks for all your inspiration. Your background in your card is stunning, I love your card! Like the rainbow of colors. Like the gold embossing on the vellum. 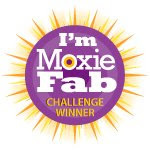 Thanks for the opportunity to win some great products. I love this background! WOW!!! Absolutely fabulous!!!! I love the colors!! Oh what a fantastic and happy card, Donna! 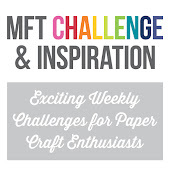 Your background is stunning and I love the gold embossed sentiment on vellum - so pretty! That sentiment goes perfectly with your smooshed background!! Great card. I love how colorful it is. The sentiment looks really good on that background. You ARE absolutely awesome - and so is this card!!! OMG!! I love your card! Great use of color, and the sentiment of vellum is perfect. Of course, as always, the sequins are the perfect finishing touch!! Beautiful DONNA! 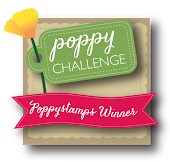 ..Love the colors and always enjoy your work...so excited t see you in this HOP and LOVE the stamps you used. I'm LOVING this release and have already placed TWO orders! Yippee~! Love the bright smooshed colors and the gold embossed sentiment. Thanks for sharing. I absolutely love your card. The background is fantastic, and the sentiment is so simply beautiful. BEAUTIFUL technique! I can hardly wait to try this! Love your background. It is so colorful, just beautiful. I also love that sentiment, looks great in gold too. Thanks. You started with a gorgeous background but that stamped sentiment on vellum really makes a big impact! WOW! I wondered how you got the darker shades in there--so pretty! Wowww!! Beautiful card, love the colors!!! Love your card. The background is fantastic. Terrific card!! I really love the background you made!! Great smooshing job :) I love blog hops. Such a lovely card. That background looks amazing! 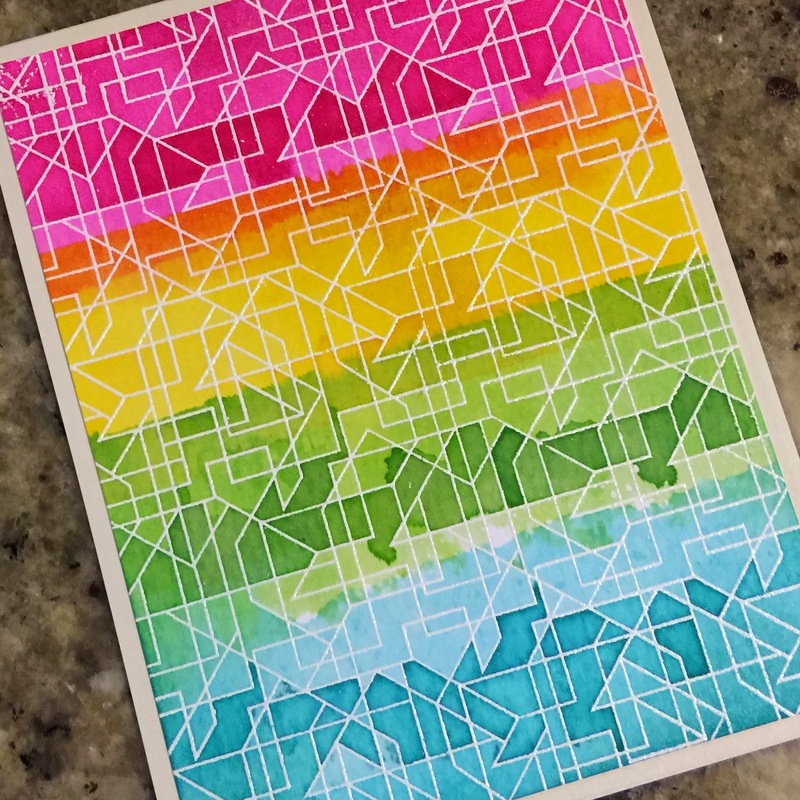 Just love what you did with the Lines Bg, Donna - so colorful and fun! Thanks for the inspiration and it was great hopping with you again!! I absolutely love her handwriting! Beautiful background and great card! Such pretty bright colors. Love them! Such a cool card, Donna. Double WOW Donna! Fabulous card, love that background you created! Thanks for sharing! The colors on your card just pop! I also love the sentiment. Wow wow wow!!! The lines background stamp is awesome!!! LOVE your background!!! Glad you used vellum for your sentiment so that your background would shine through! Very cool card. I was nervous until I read your instructions. I thought maybe you were going to say how you hand painted every box shape. Absolutely adore the colors and that sentiment, what a great card! gorgeous as usual, Donna! Fab! I just love everything about this bright and beautiful card! Donna, your card is absolutely AWESOME!!! Absolutely beautiful! Love the colours you used! So cute! Love that background! Stamp is cute too! Love All the colors in your card. Beautiful!! I love the bright colored background. Thanks for sharing. Wow!!! Yup, that about sums it up. I love absolutely everything about this card. Just fantastic! The smooshing worked beautifully! Your card is beautiful! The colors are amazing on these cards! Love the embossed sentiments too! love the bright colors and the gold embossed vellum! Love love love the bright colors. LOVE, LOVE, LOVE the colors on your card. Just beautiful!! Great cards! I especially like the smooshing! Really cute cards. 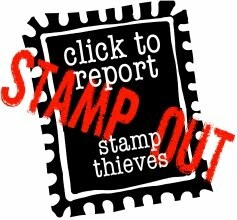 I especially love the background stamps that are being used. Wow, Donna, that background would brighten my day all by it's self... Beautiful! Like you, I also enjoy sentiment stamps that feature a mixture of fonts...but it is a skill to design them so that they are still readable without standing on your head! Beautiful work with this sentiment. I love how colorful your card is! Very pretty! Wow love that background!! The sentiment looks great embossed in gold over that background! Just love these cards-my favorites. 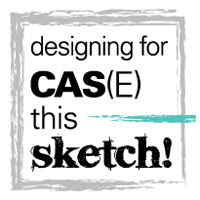 Can't wait to purchase the lines background stamp and use this Disress ink technique. Thanks for sharing!! LOVE this ink smooshed card- I still need to try this technique! Love your mixed media background - fabulous card! What a fantastic card. You did Laura proud! Incredible colours Donna. An awesome card. Wow do I have to try your technique! Bold and bright....and love the white embossing! I really like your use of bold color and the sentiment is great. Absolutely stunning card Donna. I love that background stamp. Super cool card! Love it. Gorgeous! A truly inspiring Donna card! Beautiful gradient background with the perfect vellum overlay! Oh wow! Your card is simply awesome!!!!! Need to try that technique with distress ink! What a great colorful fun background and I love the vellum! Donna, I love how you showcased the Lines Background! 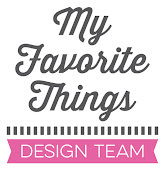 Wow colors and the sentiment is exactly what I think of you and your designs! Hero Arts is amazing and you've made it even better! love your bright sunny card! Love these cards. 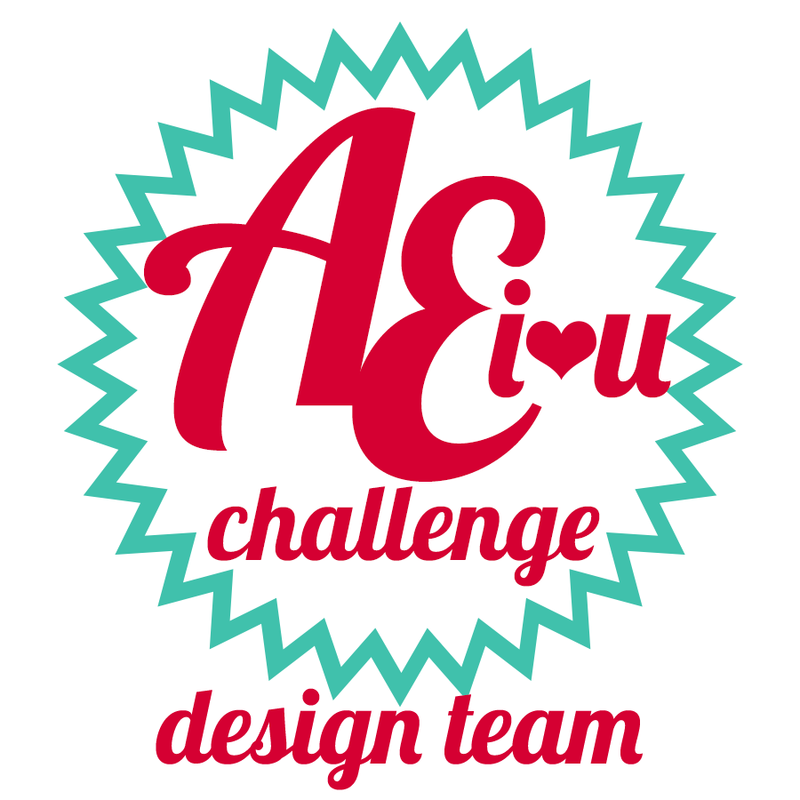 How do I become a designer for this blog? I absolutely love your card: the colors, the sentiment, everything!!! Really love that colorful background! But, the link to Laura Bassen's blog was only to the home page and not to the actual technique post. :( Beautiful card, though. Oh wow, such a gorgeous card and I love the handwriting of that sentiment! The colors are beautiful! Love this card! I really love the background you made ! I have to try that ! And the golden sentiment on the vellum is great ! What a fabulous card, Donna! When I want to see awesome watercolor, I come to your blog! !